Almost exactly four years ago, in September 2011, the border between India and Pakistan was photographed by an astronaut on the International Space Station. It showed the border as a long orange line, one of the few international borders that can be seen from low earth orbit. On 23 September 2015 the space agency NASA released a new picture. The line is as long and orange as it was, perhaps more fortified now. The cities visible on both sides of the very well lit frontier are more populous, and certainly emit more light in 2015 than they did in 2011. I have added names to the clusters of bright lights seen in the new photograph. 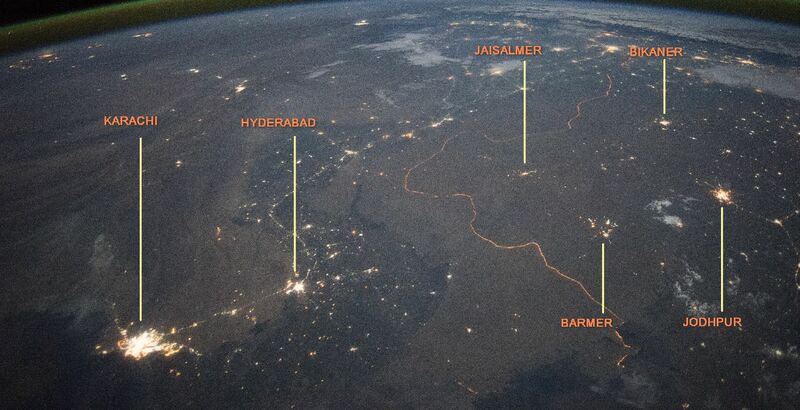 In western Rajasthan, Jodhpur, Barmer, Bikaner and Jaisalmer are all visible. In southern Pakistan, Karachi and Hyderabad are easily made out. The media has used the new photographs too, as you can see here, here, here and here. A high resolution image is available here from Nasa’s Earth Observatory website. Another night image shows the border zone looking south-east from the Himalaya. An older daytime view shows the vegetated bends of the Indus Valley winding through the otherwise desert landscape. The edge is what Pakistan and Russia did go over in 2010. 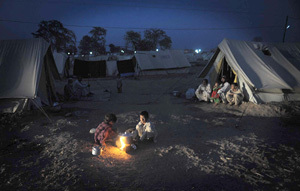 In the summer of 2010 record-high temperatures hit Moscow and torrential rains caused immense devastation in Pakistan. At first it was just another heat wave, says the first chapter of the book, but the scorching heat that started in late June continued through mid-August. Western Russia was so hot and dry in early August that 300 or 400 new fires were starting every day. Millions of acres of forest burned. So did thousands of homes. Crops withered. 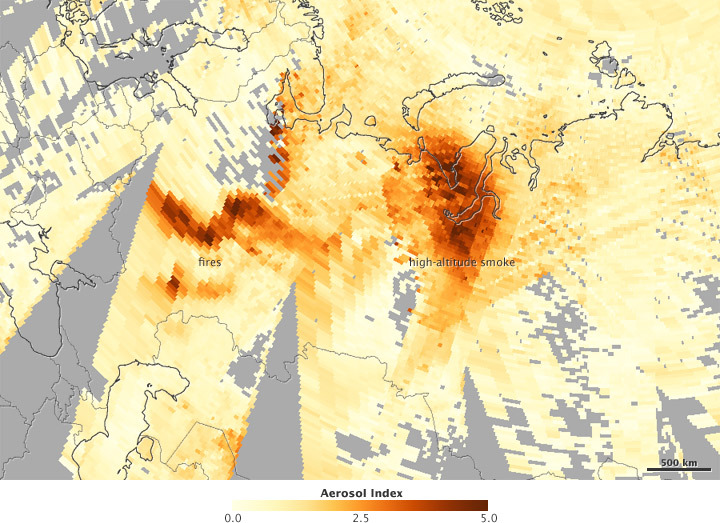 Day after day, Moscow was bathed in seemingly endless smoke. The elderly and those with impaired respiratory systems struggled to breathe. The death rate climbed as heat stress and smoke took their toll. The average July temperature in Moscow was a scarcely believable 14 degrees Fahrenheit above the norm. Twice during the heat wave, the Moscow temperature exceeded 100 degrees Fahrenheit, a level Muscovites had never before experienced. Watching the heat wave play out over a seven-week period on the TV evening news, with the thousands of fires and the smoke everywhere, was like watching a horror film that had no end. Russia’s 140 million people were in shock, traumatized by what was happening to them and their country. Even before the Russian heat wave ended, there were reports in late July of torrential rains in the mountains of northern Pakistan. The Indus River, the lifeline of Pakistan, and its tributaries were overflowing. Levees that had confined the river to a narrow channel so the fertile floodplains could be farmed had failed. Eventually the raging waters covered one fifth of the country. The destruction was everywhere. Some 2 million homes were damaged or destroyed. More than 20 million people were affected by the flooding. Nearly 2,000 Pakistanis died. Some 6 million acres of crops were damaged or destroyed. Over a million livestock drowned. Roads and bridges were washed away. Although the flooding was blamed on the heavy rainfall, there were actually several trends converging to produce what was described as the largest natural disaster in Pakistan’s history. On May 26, 2010, the official temperature in Mohenjodaro in south-central Pakistan reached 128 degrees Fahrenheit, a record for Asia. Snow and glaciers in the western Himalayas, where the tributaries of the Indus River originate, were melting fast. As Pakistani glaciologist M. Iqbal Khan noted, the glacial melt was already swelling the flow of the Indus even before the rains came. From late July through August, Pakistan received excessive monsoon rainfall across the country including many of the major rice and cotton growing areas. The extraordinary rainfall triggered severe overland and river flooding. The impact of the floodwater is most severe in Khyber Pakhtunkhwa (NWFP), Baluchistan, Punjab, and the northern districts of Sindh. These provinces have suffered significant loss of cropland and damage to agricultural infrastructure. The major kharif season (June-November) crops are rice and cotton, but a substantial amount of corn, millet, and sorghum is grown during the kharif season as well. The floodwaters are receding in the mid- and upper-reaches of the Indus Valley but continue to expand in the southern district of Sindh. The final extent of the floodwaters and the resulting damage to crops is still uncertain. 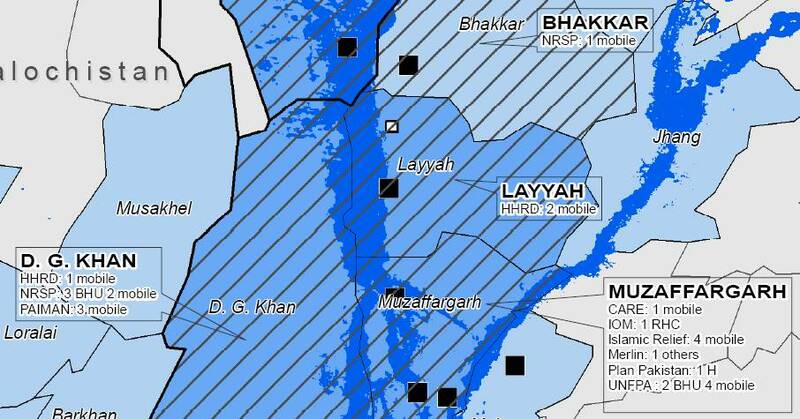 The USDA has made a preliminary assessment, based primarily on satellite imagery, which indicates significant crop damage in major rice and cotton areas along the Indus River in Punjab and Sindh provinces. The USDA forecasts 2010-11 Pakistan rice production at 5.3 million tons, down 19 percent from last month, and down 1.5 million or 22 percent from last year. Area is estimated at 2.4 million hectares, 14 percent down from last month, and down 0.4 million or 14 percent from last year. Yield is forecast at 3.31 tons per hectare, down 5 percent from last month and down 9 percent from last year. USDA damage estimates, based primarily on satellite imagery, indicate rice cropland losses of 400,000 hectares. The rice crop is at various development stages ranging from the early vegetative to the reproductive stage. Satellite-derived vegetative indices indicate that upland cropping areas will benefit from abundant soil moisture, where flooding did not occur. Cotton production is forecast at 9.3 million 480-pound bales, down approximately 2 percent from last month, and down 0.3 million or 3 percent from last year. Area is estimated at 3.0 million hectares, 2 percent down from last month, and the same as last year. Yield is forecast at 675 kilograms per hectare, down 0.4 percent from last month and down 3 percent from last year. Analysis of satellite imagery suggests cotton cropland losses at around 200,000 hectares. The crop is at various development stages ranging from early vegetative to advanced maturity, and vegetative indices indicate that most upland cropping areas, away from the flooded areas, benefited from abundant soil moisture profiles. 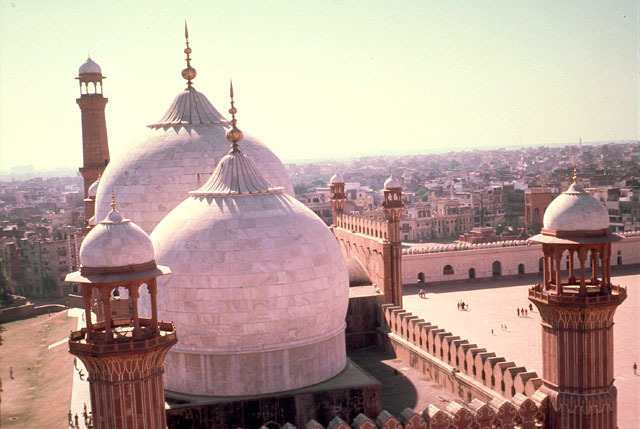 Lahore is the city of Mughal heritage. Grand buildings with delicate landscaping express the story of a splendid era of building construction. Some chapters of this monumental architecture have been torn or distorted by subsequent rulers and others are slowly turning to ruin but still stand as a witness of Mughal grandeur, as these wonderful images from the architectural website Archnet demonstrate. 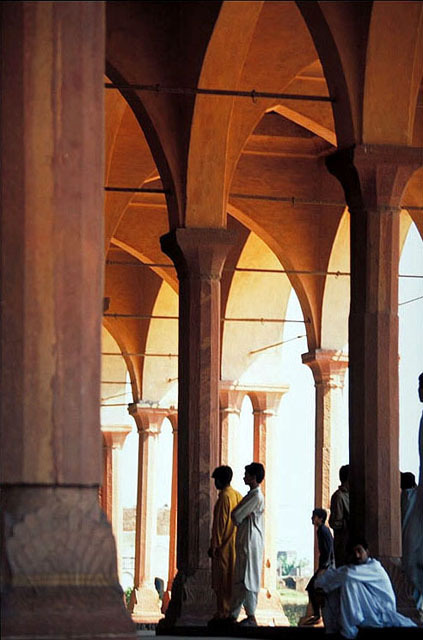 Lahore contains three gems of Mughal architectural treasure: Lahore Fort, Jehangir’s tomb and Shalimar Gardens. The fort and gardens were declared Unesco World Heritage Sites in 1981. Raza Rumi, a freelance writer from Pakistan, writes an evocative diary of Lahore at ‘Lahore Nama’ (he also writes regularly for the Pakistani weekly The Friday Times, The News and Daily Dawn). But there is an astonishing tale obscured in the Mughal history of Lahore. In the sixteenth and seventeenth centuries in northwest India a Lahori family maintained a remarkable workshop that, through four generations, produced numerous well-made scientific instruments, in particular planispheric astrolabes and celestial globes. Lahore, on the upper course of the Indus river, was then the capital of the Mughal province (or suba) of the same name, later called the Punjab. The activity of these metalworkers covered the reigns of the second through the ninth Mughal rulers of India, who spoke the vernacular Turki but maintained Persian as the official language of the court. “Three extant astrolabes were made by him, only one of which is dated. 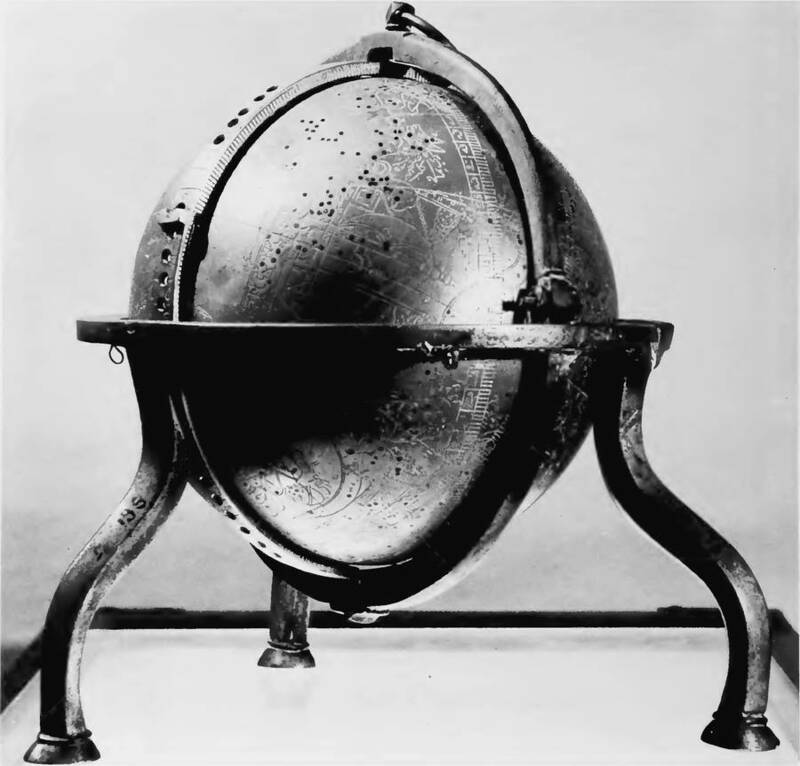 The name Allahdad is a compound of Allah (God) and dad (gift),” wrote Emilie Savage-Smith in her extraordinary research work, ‘Islamicate Celestial Globes: Their History, Construction, and Use’ (Smithsonian Institution Press, Washington, D.C., 1985).